The author has been subjected to three chronic diseases since 1997. He has maintained a disciplined lifestyle program since 2012 and collected 1.5M health and lifestyle data. This paper discusses specifically the relationship between glucose and blood pressure. Extreme values of SBP and DBP can be found on a daily blood pressure chart. A 90-days moving average for both glucose and blood pressure can identify the correlation between two signals. A spatial analysis (without time) is used to figure out a “quasi-linear” equation between them. In this paper, 13,320 data from 1,480 days (2/8/2014 – 2/27/2018) were used for analysis. He had many SBP and DBP spikes in 2014 due to two connected stressful periods caused by family members’ illnesses. After 2015, his BP (M3) has been stabilized into a healthy state. A high correlation of 79% existed between SBP and DBP with an average of 41 mmHG gap in between. 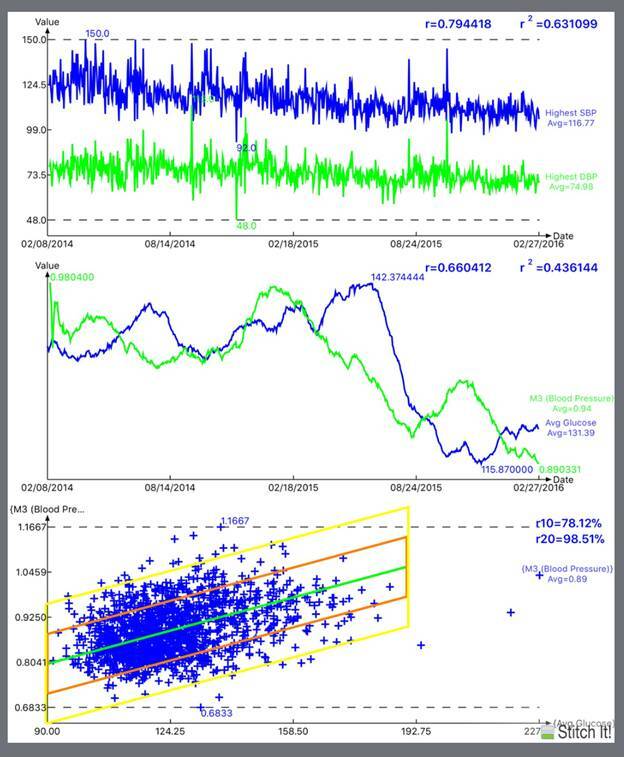 The time series analysis of 90-days moving average of glucose vs. BP (M3) shows a strong correlation of 66%. This correlation is further validated with a spatial analysis which shows 78% and 99% of the total collected data covered by a +/- 10% and +/- 20% variance band of BP (M3) respectively. This “relationship band” stretched from point A (90, 0.8) to point B (190, 1.06) on a map with coordinates of x=glucose, and y=BP, M3. Using big data analytics on an overweight patient, results show a strong relationship existing between glucose and blood pressure.